JOHN 9:25 KJV "He answered and said, Whether he be a sinner [or no], I know not: one thing I know, that, whereas I was..."
22These words spake his parents, because they feared the Jews: for the Jews had agreed already, that if any man did confess that he was Christ, he should be put out of the synagogue. 23Therefore said his parents, He is of age; ask him. 24Then again called they the man that was blind, and said unto him, Give God the praise: we know that this man is a sinner. 25He answered and said, Whether he be a sinner or no, I know not: one thing I know, that, whereas I was blind, now I see. 26Then said they to him again, What did he to thee? how opened he thine eyes? 27He answered them, I have told you already, and ye did not hear: wherefore would ye hear it again? will ye also be his disciples? 28Then they reviled him, and said, Thou art his disciple; but we are Moses' disciples. He answered, and said, Whether he be a sinner or no, I know not: One thing I know, that whereas I was blind, now I see. He then answered, "Whether He is a sinner, I do not know; one thing I do know, that though I was blind, now I see." 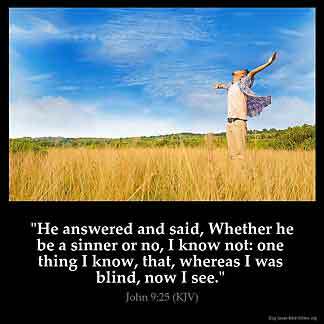 He therefore answered, Whether he is a sinner, I know not: one thing I know, that, whereas I was blind, now I see. He answered and said, Whether he is a sinner, I know not: one thing I know, that whereas I was blind, now I see. Whether he is a sinner or not, I do not know, he replied; "one thing I know--that I was once blind and that now I can see." He therefore answered, "I don't know if he is a sinner. One thing I do know: that though I was blind, now I see." Thanne he seide, If he is a synnere, Y woot neuer; o thing Y woot, that whanne Y was blynd, now Y se. This is a personal testimony.There was a physical change that he could attest that he blind but could now see.Although he did not have a personal experience with this Man of Galilee,a change in him could not be denied even by the unbelieving hypocrites.When a sinner is converted the person of Jesus Christ in him testifies of the goodness of God for the light of life is in him.He becomes a shining light to the blind world of darkness. There is no more blindness in him whom who has the the light of lights. Glory be to our God. The bright morning has risen in his heart. A new day has come. The man understood himself not the other way round. He was blind not his friends or colleagues but him. So our salvation only sees us through but by Jesus nit anybody else. This people they only wanted him to curse the Lord but he blesses and praises Him. What I know now is I can see through the eyes of my heart. I believe all to him could see because he meet the Lord. GOD IS WORKING IN OUR LIVES WE MUST BE GRATEFUL AND UNDERSTAND THAT GOD IS GOOD. People 's opinion about JESUS to me do not matter, I know the difference betweet the darkness I dwelt and the light HE had brought me in,Taste the LORD, HE is good, glory. To my understanding this man didn 't know Jesus in a personal way and therefore did not know Him in His Deity But the man knew that once he was blind but now he sees . As I was once a sinner but now that Jesus touched me I see now . Praise God !!! !